YUTAN, Neb. 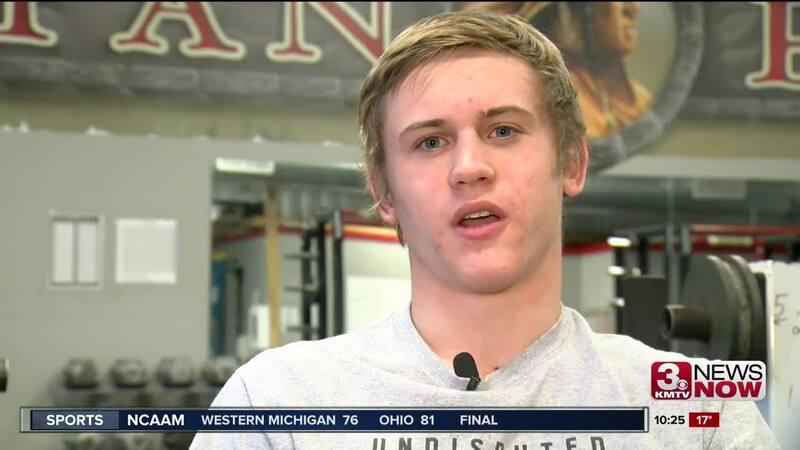 (KMTV) — Logan Moan's wrestling record this year has hovered right around 500. But when you look at the two biggest opponents the Yutan senior has taken down in his life, Logan remains undefeated. In 2008 at the age of seven, Moan was diagnosed with type 1 diabetes. "He's kind of a pin or get pinned guy so we're fortunate he hasn't had too many long matches," said his mother, Amy. Moan, however, still made time for his favorite sport, dirt bike racing. "I think I've been on a bike before I could even say the alphabet correctly," Logan said. "I'd probably quit all other sports before I quit that one." In 7th grade Logan took up football, then in high school started wrestling. On May 24th, 2018, almost ten years to the day of his diabetes diagnosis, Logan's life would take another dramatic turn. On the first day of summer break, he had an accident at the dirt bike track in Lincoln. "I rolled over and i could feel my right hip that really hurt and I was like 'Ok, there's something wrong with you a little bit there," said Logan. "Then we get to the O.R. and he's in bad shape," Amy said. "He looks really rough. His legs are like a figure eight. His face is gray, his circulation and color were terrible. And, of course, I'm screaming 'he's a diabetic! he's a diabetic! be watching his blood sugars!'. And he's screaming something for pain. Finally I said, like any mother would 'can you give him something for pain?' So they finally did but he was in shock so doesn't remember any of that fortunately." Logan suffered two broken femurs and an abdominal puncture wound. He would be life-flighted to Bryan Medical in Lincoln and would need surgery to put metal rods in his legs within 48 hours. The doctor, though, did offer some good news. "The surgeon told us that 'I'll have him ready for football'," Amy said. "And I thought she was nuts. I said there's no way that kid's going to be ready for football." "I didn't think there's a chance he plays football," said Yutan head coach Dan Krajicek. "When he told me he was going to be back I was like 'yeah whatever." Following a week at Bryan and 31 days at Madonna Rehabilitation Hospital in Omaha, Logan returned home. And when the first week of football practice arrived in august, Logan was there. "We were pretty apprehensive, I'll say that much," said Krajicek. "We're like 'gosh, he's going to break again or something." Although, he wouldn't be cleared to play in a game until early October, Logan participated in every practice. When he finally was cleared, he made the most of his opportunity, even picking off a pass. "He has never once asked for anything extra or any special treatment," Krajicek said. "I don't know if it was because he was diagnosed with a chronic illness at age seven or if it's just who he is personality-wise but he's always been a fighter and this just proves it once again," said Amy. After football, Logan was fully cleared to return the wrestling mat, where he won his first match of the season. "Kind of jokingly, I'm like 'Logan, you know you've got to bend certain ways for wrestling right?" said Krajicek. "And he's like 'Yeah, I'll just have to not get into those positions." His greatest victory, however, might've come in late October when Logan returned to the same track where the accident occurred to compete in the state championships. "You have to go back to it," Logan said. "You can't be afraid forever. Your limits are set by you. That's all there is to it." "He always said I'm not afraid to die I'm just afraid not to live," said Amy. "He's always said that. And I think that kind of captures what he thinks and believes." Logan dresses up in a dinosaur costume to visit the kids who are still at Madonna. Next year he plans to go to college to learn how to work on ATV's, motorcycles & jet skis.